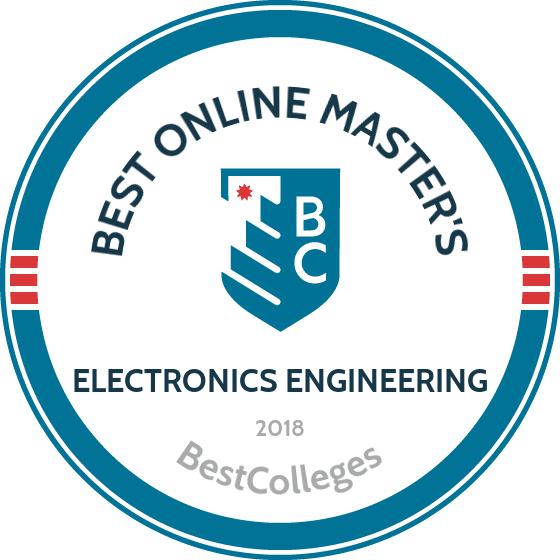 What Are The Best Online Master's in Electronics Engineering Programs? What Else Can I Expect From an Online Master's in Electronics Engineering Program? Electronics engineers design and construct the technologies we use in nearly every aspect of life. From local access computer networks to fiber optics and circuit boards, electrical engineering plays an integral role in how we work, communicate, and interact with the world around us. As technological innovations continue to drive the development of new products and services, the demand for electronics and electrical engineers will accelerate. While engineering is known to be a financially rewarding field, it is also highly competitive. Increasingly, electronics engineering professionals are seeking graduate degrees to distinguish themselves on the job market and to enhance their earning power. The payoff for pursuing higher education is significant, with master's degree holders earning up to 13% more annually than engineers who hold only a bachelor's degree. Along with higher salaries, a master's program helps students develop new skills and specialties, and opens a range of exciting job opportunities. One of the world's top research colleges, Stanford University’s relationship with Silicon Valley facilitates leadership in technology and engineering. Students in the 45-credit master of science in electrical engineering receive a comprehensive education in physical science and mathematics, engineering techniques, and the application of technology in society. Students enroll part-time to facilitate work schedules and can take the program fully online or in hybrid format. The curriculum includes study of digital systems, linear dynamic systems, statistical signal programming, computer systems architecture, and wireless communications. Engineering students interact with MBA business owners and others during a course that cultivates an entrepreneurial engineer mindset for future business owners. Learners complete the electronic engineering master's degree online in 3-5 years. Admission requires a bachelor's degree and a background in engineering, mathematics, or the physical sciences. Admitted students usually possess above average GPA and GRE scores. Georgia Tech’s graduate electrical and computer engineering program is the largest in the nation and administers the 30-credit master of science in electrical and computer engineering to students hoping to harness technology to problem-solve and innovate. The fully online program studies advanced signal processing, computer network security, advanced computer architecture, wireless networks, analog integrated circuit design, and optimal control and optimization. Graduates of the electronics engineering master's degree online become sought-after commodities in fields such as aerospace, robotics, energy, and manufacturing. The school's location in Atlanta, one of the fastest growing areas for high-tech innovation, provides a lucrative market for networking and job opportunities. Admission requires a bachelor's degree in an engineering field, computer science, or physics, and GRE scores. The nation's first research college, Johns Hopkins University boasts 27 Nobel Laureates among many accomplishments. The school's master of science in electrical and computer engineering prepares engineers to develop systems for communication, information transformation, and computation and measurement applications. The part-time hybrid or fully online program gives learners a foundation in electromagnetics, systems theory, and electronic devices as they learn to build architectures for next-generation mobile technology. Students take two prerequisite courses: signals and systems and circuits, devices, and fields. The program offers focus areas in communications and networking, computer engineering, electronics and the solid state, optics and photonics, RF and microwave engineering, and systems and control. Students take one of two concentrations: photonics and communications or networking. Learners have five years to complete the 10 courses of the master's in electronics engineering online. Admission requires a bachelor's degree in electrical, computer, or related engineering or science field from an ABET-accredited program. USC enrolls about 45,000 students on its Los Angeles campus and through online delivery. The USC Viterbi School of Engineering Ming Hsieh Department of Electrical Engineering administers programming nationally recognized for innovation and leadership in areas such as signal and image processing, communications, computer engineering, controls, and electrophysics. Students enrolled in the hybrid 28-unit master of science in electrical engineering acquire skills necessary to excel in a rapidly changing technological landscape. The program's curriculum offers several focus areas, including communications, computer networks, electric power systems, optics/photonics, and VLSI Design. Students may enroll in the MS in Electrical Engineering online via DEN@Viterbi on a full-time or a part-time basis, completing the degree within an average of two to three years. Graduates secure careers in business and industry, academia, or become entrepreneurs. Admission requires a bachelor's degree in engineering or a related field with a recommended minimum 3.0 GPA. The University of California-Los Angeles's (UCLA) pioneering spirit led to groundbreaking innovations in the arts and sciences and 13 Nobel Prizes. UCLA’s Henry Samueli School of Engineering and Applied Science, the birthplace of the internet, administers a 36-credit master of science in engineering-electrical focused on systems engineering; system architecture; reliability, maintainability, and supportability; and model-based systems engineering. Students may opt to take business courses in data and business analytics, intellectual property law, and management communication. A notable course on entrepreneurship for engineers complements students' technical competencies with an examination of how they can start their own high-tech companies. A teaching apprentice practicum open to students in the master's in electronics engineering online allows them to work as a teaching assistant, fellow, or associate under faculty supervision at UCLA. Students demonstrate competencies and culminate the program through a capstone project. Admission requires a bachelor's degree in engineering, or a related science field, and the GRE. Founded 200 years ago, the University of Virginia emphasizes cross-disciplinary learning. The Electrical and Computer Engineering (ECE) Department administers the 30-credit master of engineering (ME) in electrical engineering to students with a strong foundation in electrical engineering. Generally, applicants to the program do not seek financial aid from the department. Learners must select an area of research interest from among several options: controls, communications, electrophysics, device fabrication, RF and microwave devices, VLSI and microsystems, and safety-critical systems. In addition to the curriculum, the program provides students in the electronics engineering master's degree online access to several research groups and labs. ECE faculty often engage in cross-disciplinary partnerships to solve some of society's challenges. Admission requires a bachelor's degree in engineering or applied science, a minimum "B" grade, and the GRE. Lehigh University’s 30-credit master of engineering in electrical engineering prepares engineers versed in technologies used for advancements in nanotechnology, biotechnology, and information and communication technology. The hybrid curriculum includes a nine-credit core with study of advanced electromagnetics, wireless communications, advanced computer architecture, advanced circuit and systems, and the physics of semiconductor devices. The electronic engineering master's degree online offers three concentrations: optoelectronics and biophotonics; wireless communications, networking, and sensing; and nanoelectronics, microelectromechanical systems. Each concentration gives students ample research opportunities, and learners must complete a design project and make a presentation. Students learn from faculty engaged in nationally funded research in areas like bioengineering, space-time coding, optical communications, and microelectronics fabrication. Admission requires a bachelor's degree in electrical engineering or a related field, prerequisite coursework, and the GRE. For 168 years, the University of Wisconsin-Madison has worked to solve challenges facing the world. The school’s 30-credit master of science in electrical engineering: power engineering enrolls both engineers pursuing advanced training and recent graduates seeking to earn a master's. Students develop competencies in power electronics, electric power, electric machines, and motor drives. The online curriculum also includes study of advanced robotics, the dynamics of controlled systems, and computer control of machines and processes. Students in the electronics engineering master's degree online must visit the campus for labs in advanced controls, power electronics, and automatic controls. Students complete the program full-time or part-time in two to four years. Admission requires a bachelor's degree with a minimum 3.0 GPA from an ABET-accredited institution (electrical engineering major preferred). Students must also complete the Capstone Certificate in Power Conversion and Control with a minimum 3.3 GPA for admission. One of the largest private colleges in the nation, New York University enrolls approximately 50,000 students from around the world. The 30-credit master of science in electrical engineering advances learners' knowledge of how to implement industrial architecture, including applications for hand-held devices. The fully online or hybrid program includes a core, several concentration options, and electives from other departments. Students select two of four courses in the core: linear systems, digital signal processing, probability and stochastic processes, or electromagnetic theory and applications. While the school does not require students to declare a concentration, they may opt to focus on one or two concentration areas, including communications, signal processing, systems and control, and energy systems and power electronics. The school provides students with streamlined communication with its esteemed faculty and access to mentors. Admission requires a bachelor's degree in electrical engineering from an ABET-accredited program and school transcripts. North Carolina State University at Raleigh (NC State) began as an institution focused on agriculture and engineering and continues that tradition today. NC State's Engineering Online administers a 31-credit master of science in electrical engineering with strengths in power electronics and power systems, communications and signal processing, and nonelectronics and photonics. The electronic engineering master's degree online offers specialty areas that include circuits, communications, signal processing and computational intelligence, and microwave circuits and applied electromagnetics. Students must maintain a minimum 3.0 GPA in the program, and all requirements must be met within six years. Learners do not need to take an oral exam, write a thesis, or spend time on campus to complete the degree. The program allows for full-time or part-time enrollment. Admission requires a bachelor's degree in electrical or computer engineering, a minimum 3.25 GPA, and the GRE. Established in 1876, Texas A & M University-College Station offers a world-class education buoyed by the school's strengths in research and innovation. Students in the online 30-credit master of engineering in electrical engineering learn from faculty actively engaged in state-of-the-art research in electrical engineering. Students work with advisors and faculty members to develop a plan of study that meets degree requirements and satisfies their career goals. Learners must declare an area of specialization from among several options, including analog and mixed signal, information science and systems, electromagnetics and microwaves, electric power systems and power electronics, and device science and nanotechnology. Students may elect to participate in a three-credit seminar, internship, or directed studies. Learners can transfer up to six credits into the electronics engineering master's degree online from a peer institution. Admission requires a bachelor's degree in electrical engineering or a related field and GRE scores. Worcester Polytechnic Institute emphasizes project-based learning that balances theory and practice. In keeping with that tradition, the 30-credit master of science in electrical and computer engineering offers a rigorous plan of study focused on real-world applicability. Students learn from faculty experts in wireless network technologies, green power, and biomedical systems. The 10-course master's in electronics engineering online offers four specializations: analog/RF design, digital systems design, power systems engineering, and systems engineering. Students work with faculty to develop a customized plan of study that addresses their areas of interest. Individual course subjects include electronics, systems engineering, analog design, digital design, radio and microwave engineering, and power systems. The school's in-demand graduates find employment at companies such as BAE Systems, Intel, Nokia, and Oracle. Admission requires a bachelor's degree in engineering from an ABET-accredited program, official school transcripts, and the GRE for international students. Located in Hoboken, New Jersey, Stevens Institute of Technology offers a hybrid 30-credit master of science in electrical engineering. Students take a rigorous engineering plan of study and participate in faculty research funded by notable organizations such as the National Science Foundation, National Institute for Justice, and several private organizations. Learners take coursework focused on math, analytical skills, core electrical engineering, and three courses in a concentration area. The curriculum offers four primary areas of research: signal processing, multimedia systems, microelectronic systems, and networked information systems. Students may elect to take an internship with the approval of faculty. Students must, however, complete a thesis to culminate the electronic engineering master's degree online. Admission requires a bachelor's degree in electrical or computer engineering, a minimum 3.0 GPA, and GRE scores. Purdue University's research and academic prowess fuel the work of inventors and innovators across disciplines and industries. The school's 30-credit master of science in electrical and computer engineering advances the competencies of working engineers able to lead technological advancements. The part-time program allows students to design a plan of study that suits their career goals. The online degree offers specializations in automatic control, fields and optics, VLSI and circuit design, communications and networking, image and signal processing, and power and energy systems, among others. Students in the electronic engineering master's degree online may elect either the thesis or the non-thesis option. Admission requires a bachelor's degree in electrical or computer engineering, a minimum 3.25 GPA, the GRE, and school transcripts. The University of Texas at Austin offers top-ranked academics and cutting-edge instruction. The Cockrell School of Engineering’s 30-credit master of science in engineering in electrical and computer engineering provides students with a foundational education in electrical and computer engineering and the opportunity to specialize. Students tailor a plan of study to accommodate their research interests and career aspirations. They choose from nine academic tracks focused on research in areas such as integrated circuits and systems, biomedical engineering, solid-state electronics, and software engineering and systems. The flexibility of the electronics engineering master's degree online includes coursework-only, thesis, and report options. Students study at their own pace and may complete the degree in two years with only one on-site visit required. Admission requires a bachelor's degree in electrical or computer engineering, a minimum 3.0 GPA, the GRE or GMAT, and a minimum of 18 months experience in the industry. The University of Minnesota-Twin Cities boasts Nobel Prize-winning faculty, MacArthur Fellows, and many other distinctions. The Department of Electrical Engineering offers programs focused on all aspects of electrical and computer engineering, from system and information theory to experimental work in research and microelectronics. Students take the 30-credit master of science in electrical engineering fully online or in hybrid format. Students choose either a thesis plan of study or the coursework-only option. The major's areas of emphasis include solid state and physical electronics, quantum electronics, power systems and power electronics theory, and VLSI and WSI engineering. Students in the master's in electronics engineering online may also engage in interdisciplinary study in areas like biological modelling, bioelectrical sciences, solar energy, and computer science. Admission requires a bachelor's degree in engineering, physics, science, or mathematics; a minimum 3.4 GPA; and the GRE. Villanova University offers a liberal arts education rooted in the Augustinian tradition. The Pennsylvania institution offers full-time engineers part-time degree options through the College of Engineering. Most of the students enrolled in the hybrid 30-credit master of science in electrical engineering do so on a part-time basis, taking one course each semester and earning the degree in three years. Students acquire new engineering competencies through the program's five concentration areas: electric energy systems; electronic circuits and systems; system dynamics and controls; microwave, antenna, and photonic systems; and signal processing and communications. Students design a plan of study to address career interests. Students may us up to nine credits in the master's in electronics engineering online for research activities. Graduates find employment at companies like Lockheed Martin, the Naval Surface Warfare Center, and PECO. Admission requires a bachelor's in electrical engineering with a minimum 3.0 GPA and the GRE for full-time applicants. One of the nation's top technological colleges, the New Jersey Institute of Technology offers programs that emphasize applied, interdisciplinary research in disciplines such as engineering. Students in the 30-credit master of science in electrical engineering develop the expertise required to advance in engineering across industries. Learners select one of three in-demand specialty tracks tailored to their career interests: mechatronics; power and energy systems; or communications, signal processing, and microwave. The 10-course program delves into the latest techniques and methodologies in electrical engineering. Students in the electronic engineering master's degree online learn how to lead and manage from faculty internationally recognized for research in engineering. Learners complete the program fully online in as few as 19 months. Admission requires a bachelor's degree in electrical engineering or another engineering discipline, a minimum 2.8 GPA, and the GRE. Located in the heart of New York State, Syracuse University offers 200 majors and ample opportunities for interdisciplinary and collaborative learning. The master of science in electrical engineering's interdisciplinary curriculum prepares engineers versed in technical competencies and problem-solving and critical thinking skills necessary for a quickly evolving field. Students can complete the 30-credit program in as few as 20 months of online study. The curriculum includes a 12-credit core in courses like digital communications, electromagnetic fields, digital electronic circuits, semiconductor devices, and functional methods of engineering analysis. Students use 18 credits of electives for coursework in specialty areas such as modern control systems, digital signal processing, and embedded system design. They attend online lectures asynchronously or in real-time through live webcast. Students in the master's in electronics engineering online learn from world-renowned scholars, researchers, and leaders in electrical engineering. Admission requires a bachelor's degree in electrical engineering with a minimum 3.0 GPA and the GRE. Virginia Tech takes a transdisciplinary approach to learning that creates problem-solvers able to tackle some of society's big challenges. The Electrical and Computer Engineering department offers a 30-credit master of science (MS) in electrical engineering and computer engineering and a 30-credit master of engineering (ME) in electrical engineering and computer engineering. The degrees differ insofar as they accommodate employer preferences for engineers with demonstrable research and writing skills (MS thesis) or those with more coursework (ME project and report). Learners in the electronics engineering master's degree online choose a specialization such as power; electromagnetics; signals, systems, and controls; software and machine intelligence; or VLSI and design automation. The department's research programs model the school's interdisciplinary learning emphasis. The school gives students access to more than 35 research groups, labs, and centers. Admission requires a bachelor's degree in electrical engineering, computer engineering, physics, or math with a minimum 3.3 GPA and the GRE. The University of Colorado Denver's offers a 30-credit master of science (MS) in electrical engineering and a 30-credit master of engineering (ME) in electrical engineering. The non-thesis ME caters to engineers planning to pursue technical or entrepreneurial careers. Engineers in the MS pursue research careers and need specific technical expertise with interdisciplinary flexibility. Students take both electronics engineering master's degrees online, studying areas such as biomedical engineering; computer engineering; dynamics and controls; nanostructures and device; digital signal processing communication; and electromagnetics, RF, and microwaves. The program boasts a 100% post-graduation employment rate. Students in Connecticut, Delaware, the District of Columbia, and Utah cannot enroll in online programs at UC Denver. Admission requires a bachelor's degree in electrical engineering with a minimum 3.0 GPA and the GRE. Colorado State University-Fort Collins offers a 30-credit master of science (MS) in electrical engineering and a 30-credit master of engineering (ME) in electrical engineering. Students learn from faculty with research interest areas like robotics, communications and signal processing, and distributed and embedded system design. The programs' flexibility allows students to customize a plan of study that fits their educational and career goals. The electronic engineering master's degrees online include study of optical properties of nanostructures, high resolution metrology techniques, grid integration of wind energy systems, linear and non-linear optical properties, and engineering concepts of high-power pulsed electronics. Students complete the MS or ME fully online in two years. Admission requires a bachelor's degree in engineering, computer science, or a related field with a minimum 3.0 GPA, and the GRE. Part of the prestigious University of Texas System, UT Tyler offers programs through seven academic colleges. The school’s hybrid 30-36 credit master of science in electrical engineering allows students to tailor their degrees to meet their career aspirations -- preparing them for careers in engineering research and design or for doctoral studies. Many students in the program work at an electrical engineering practice or in engineering research and development. The program offers coursework in VLSI design, solid state devices, optical fiber communication, and wireless communications and networks. Students learn from faculty actively engaged in research and with many years of industry experience. Matriculating students may transfer up to nine graduate credits into the electronic engineering master's degree online. Admission requires a bachelor's degree in electrical engineering with a satisfactory GPA from an ABET-accredited program and GRE scores. The University of Utah (U) offers academic programs that promote both scholarship and innovative thinking. The Electrical and Computer Engineering department gives engineers the opportunity to earn graduate degrees in fully online and hybrid formats. The 30-credit master of science in electrical and computer engineering offers a coursework-only track. Areas of study include power, electromagnetics, micro/nano systems, computer architecture, digital VLSI design, and signal processing/communication. Students use electives to take courses from a comprehensive range of options, including wireless communication systems, advanced embedded software, and distributed operating systems. Learners may enroll in the electronic engineering master's degree online on a part-time or a full-time basis. Many graduates go on to secure employment at Fortune 500 companies. Admission requires a bachelor's degree in electrical or computer engineering with a minimum 3.2 GPA and GRE scores. The Missouri University of Science and Technology offers a 30-credit master of science (MS) in electrical engineering to distance learners. The program focuses on technical proficiency, problem-solving skills, and understanding the inner workings of complex global projects. The degree, which offers both thesis and non-thesis options, includes study of circuits, electromagnetics, control systems, communications and signal processing, and devices and optics. Students who choose the thesis option must complete six hours of research. Though they do not guarantee admission, several graduate certificates provide a gateway into the electronics engineering master's degree online. Students earn certificates in areas such as computational intelligence, electric machines and drives, and electric power systems engineering. Admission to the MS requires a bachelor's degree in a related field, a minimum 3.3 GPA from an ABET-accredited program, and GRE scores. Every online master's program includes distinct course offerings, concentrations, and requirements. Some engineering concepts, however, are addressed in nearly every curriculum. The information below is only a brief summary of some of the topics you may encounter while earning a master's in electronics engineering online. Digital Systems: Building off concepts introduced in undergraduate study, coursework presents a detailed look at digital systems architecture and related concepts in statistics and probability. In addition to modes, data types, and low-level data structures, learners examine various system design implementation alternatives and tradeoffs between hardware and software. Computer Architecture: Prospective computer engineers receive a broad introduction to the fundamentals of digital hardware design and systems architecture. Topics address pipelining and hazard control, addition and subtraction circuits, memory systems, and digital-to-analog conversion. Students may be required to complete a hands-on design project demonstrating their acquired knowledge. Introduction to Wireless Technology: Lectures and software-based exercises explore the technologies and systems behind cellular and wireless computer networks, personal communications systems, satellite networks, and speech and video coding. Learners develop proficiency in fading and interference reduction techniques commonly used by electrical and sound engineers, including adaptive modulation, MIMO, and equalization. Fourier Transform and Techniques: Introducing the Fourier transform theory and its many applications in imaging and optics, this course examines the ways in which this mathematical principle can help solve practical engineering problems. Topics covered include continuous and discrete signals, scalar diffraction theory, spatial filtering and processing, and convolution and correlations. Integrated Circuits Technology: Understanding semiconductor design and construction is a crucial aspect of both electrical and materials engineering. This class presents the critical concepts in microwave design, silicon wafer fabrication, and CMOS technology needed to conduct research and complete simple CAD design projects. Prerequisite coursework in microwave circuitry is typically required. How Long Does It Take to Get an Online Master's in Electronics Engineering? How long it takes to earn a master's in electronics engineering online depends on several factors, including program structure, pacing, and delivery method. Typically, an electronics engineering curriculum consists of 30-40 credits, with full-time students earning their degree in around two years. However, some programs may be as long as five years or as short as 12 months. Asynchronous, self-paced courses allow students to complete assignments more quickly than other formats. While asynchronous programs provide a greater deal of scheduling flexibility, they also require self-discipline and commitment. In contrast, cohort-based programs emphasize collaborative learning and faculty support. More closely resembling traditional on-campus courses, they are highly structured and take longer to complete than their asynchronous counterparts. Other aspects that influence degree length include internships or practicum requirements, pursuing an area of concentration, transferring credits from another institution, and any unfulfilled prerequisites a student may need to complete before pursuing major coursework. Fundamentals of Engineering (FE): Recent graduates and students enrolled in ABET-accredited programs qualify to take the 110-question FE exam, which is typically the first step towards becoming a professional licensed engineer. The test, which takes approximately six hours to complete, measures understanding of fundamental concepts in math, ethics, economics, and electrical and computer engineering. Professional Licensed Engineer (PE): Engineers with four or more years of post-college work experience may sit for the PE exam, which measures a candidate's competency in their chosen engineering subfield. The eight-hour, 80-question electrical and computer engineering exam covers topics ranging from data encryption to power systems analysis and modulation techniques. Accreditation is a quality control process conducted by regional and national agencies. Known as accrediting bodies, they assess colleges and universities to ensure they adhere to the highest academic and ethical standards. Most for-profit vocational institutions receive national accreditation, while academically-focused, nonprofit universities are typically regionally accredited. Regional accreditation is usually preferable, as it allows for easier credit transfer between institutions, and is generally seen as more prestigious than national accreditation. Additionally, some organizations specialize in programmatic accreditation and assess individual schools or academic programs within a particular field. Programmatic accreditation plays a stronger part in engineering employment and education than in most other sectors. ABET is the most well-known and respected engineering accreditor, and many employers prefer or exclusively hire graduates of ABET-accredited programs. Certain credentials, such as FE and PE licenses, are also restricted to candidates who have completed an ABET-accredited program. Accreditation also helps the U.S. Department of Education (ED) determine which institutions are eligible to receive federal financial aid. While the ED does not accredit schools itself, it relies on accrediting bodies to ensure that government-financed colleges and universities are operating according to standards and appropriately utilizing funds. Accrediting bodies, in turn, are monitored by external organizations such as the Council for Higher Education Accreditation (CHEA). Made up of representatives from over 3,000 schools, CHEA advocates for accreditation awareness and fights degree mills by maintaining a comprehensive database of accredited schools and programs around the world. Individuals with a master's degree in electronics engineering consistently out-earn those who hold only a bachelor's. As the table below demonstrates, this phenomenon extends to many different careers and specialties in electrical engineering and related fields. Using data gleaned from PayScale, the following chart displays the sharp contrast in earning power between professionals with a bachelor's degree and master's degree holders in the same role. There are many paths available to individuals who earn an electronic engineering master's degree online. Electrical equipment and computer systems are used in nearly every sphere of modern life, and graduates find work in an array of industries and settings. Requiring an eye for detail and strong computer skills, careers such as the ones below are often as lucrative as they are fulfilling. From flight systems to fiber optics, the field holds something for everyone. Tasked with the design and development of electronic devices and equipment, these engineers are employed in a range of industries. Some work for the federal government, constructing satellites, aeronautic systems, and radar communication devices, while others develop new products for companies or specialize in product and system maintenance. Like electronics engineers, computer hardware specialists design, test, and repair equipment. Often working alongside software developers, they build processors, networks, circuit boards, and other devices used in conjunction with cutting-edge computer software. Computer hardware engineers are expected to have some programming experience, and often need a master's degree to qualify for specialized roles. These specialists manage and maintain an organization's computer systems, addressing security issues and optimizing procedures as required. Working with systems such as local area and wide access networks, they ensure that all data communications networks are secure and run efficiently. To stay up-to-date on new technologies, they must periodically seek continuing education programs. Network architects design and build data communication networks according to their organization's specifications and needs. They work alongside other IT employees to approach network construction and database design from multiple angles. Because the job is closely tied to business practices, some employers prefer candidates with an MBA or related degree. Combining marketing principles with engineering know-how, this position requires extensive knowledge of the scientific processes behind electronic devices and systems. Charged with selling complex technologies to businesses and organizations, sales engineers work for firms and companies. They may be required to research, develop, or modify products to better fit consumer needs. Professional engineering organizations hold a variety of valuable resources for students and recent graduates alike. From career services to networking opportunities like conferences and seminars, the benefits of joining one of these professional interest groups are almost limitless. Many offer skill-building continuing education (CE) and certification programs, exclusive scholarship opportunities, and mentoring programs. Membership also looks great on a resume or CV. Below are several major engineering associations that one may be interested in exploring further. The world's largest professional organization dedicated to technology, IEEE has expanded beyond its electrical engineering roots to welcome all tech experts. Student members receive extensive career and academic assistance resources. Made up of engineers and engineering students from 150 countries, the IET is home to a large database of CE programs, webinars, and digital research publications. It awards over one million dollars in scholarships annually. Serving as an advocate for female engineers worldwide, SWE is committed to building leadership and technical skills through affinity groups, networking opportunities, and professional development programs. Setting the standard for professional engineering credentialing, NSPE is home to the FE and PE certification programs, as well as a variety of on-demand CE courses and exam preparation materials. This association provides engineers, scientists, and other professionals specializing in optics and photonics with a place to share research, knowledge, and resources. Its digital library is among the largest of its kind. Students pursuing an electronics engineering master's degree online have a variety of funding options. Completing the Free Application for Federal Student Aid (FAFSA) helps the government determine how much federal financial aid you may be eligible for, including grants, scholarships, and student loans. Many nonprofit organizations, special interest groups, and businesses also sponsor scholarships and grants. Some employers offer tuition reimbursement programs as an incentive for employees to gain new skills and stay up to date on new technologies. Schools featured in our rankings demonstrate a commitment to high-quality education for their students. Quality is measured and weighted through various data points that are specific to each ranking topic. Each methodology drives proprietary calculations, which are grounded in statistical information, and developed to recognize academically robust, affordable colleges and programs. Sponsored school listings are separate, paid advertisements and are clearly marked with a "SPONSORED" tag to distinguish them from editorially ranked schools. Our school rankings are editorially determined, independently vetted, and are not influenced by schools that pay for advertisements. For questions regarding our rankings or sponsored schools, please email us at contact@bestcolleges.com.